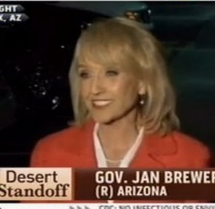 On Mediaite: when President Obama was in Arizona recently he had a tense exchange with Governor Jan Brewer, reportedly over her characterization of their relationship in her memoir (ugh) “Scorpions For Breakfast” (double ugh). Now Governor Brewer is looking to extend the story further, commenting that she thought his reaction to the book was “thin-skinned.” Ooooooh, I’m TELL-ing!!!!!! To read the full post, click here. Hmm. Geekosystem looks at a rumor that NBC might try to develop a spin off of The Office featuring Rainn Wilson’s Dwight Schrute as the lead. 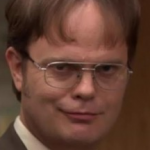 Although the idea is sort of intriguing, especially given how lackluster The Office has been in recent seasons, it seems that a little Dwight goes a long way. I’m skeptical of how long I would be able to tolerate the character in a lead role, is what I’m saying. To read the full post, click here. 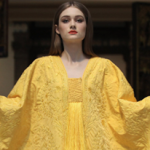 Um, wow — Styleite has photos of a beautiful yellow cape that was made from the silk of over 1,000,000 spiders. The only other garment of its kind was made in Paris in 1900 but is no longer around for us to admire. Luckily, there are plenty of photos of this stunning garment upon which you may feast your eyes! To see pictures and read the full post, click here. 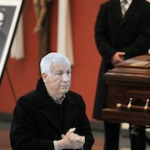 Sportsgrid has The Onion’s write up of Penn State coach Joe Paterno’s funeral, and, well, if you’re looking for someone to pull punches where Joe Paterno is concerned, you should look elsewhere. A sample: “I had years of great times at Penn State,” Sandusky said. “Years and years of great times. And I owe every minute to Joe Paterno.” Get the full post here. On Gossip Cop today: The “Real Housewives of Beverly Hills” reunion special promises to be fuuuuull of crazy, but one of the biggest revelations comes from Kim Richards. After spending some time in rehab after the current season wrapped, Richards admits on camera that she is an alcoholic. Wow! To watch the clip, click here. 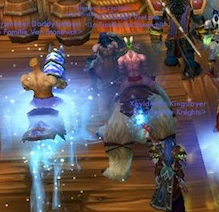 The Mary Sue taught me two things today: that World of Warcraft has an in-game profanity blocker (surprisingly prudish!) and that until now it included the words “homosexual” and “transsexual.” Boo! The good news is that the makers of the game are removing the blocks on those words. Good for them! To read the full post, click here. On The Jane Dough: remember that show “Shark Tank?” It got renewed for a second season. I know! The Jane Dough counts down the best female entrepreneurs on the show this time around. Good luck to all of them, even though I have no idea who watches this show. To read the full post, click here.